Amazingly thin PCs with Kaby Lake will get 4K video, VR capabilities, and longer battery life. Laptops and tablets with Kaby Lake are so thin and light that their weight in a backpack is not noticeable, unless it’s a fully loaded gaming PC. Samsung’s new 13.3-inch Notebook 9 weighs an amazing 816 grams, but offers only seven hours of battery life. Low-power Kaby Lake chips will also be in laptops and 2-in-1 devices from Lenovo, HP, Acer and Dell that weigh 1 to 1.5 kilograms. Intel says users can expect 10 hours of battery on thin-and-light laptops and tablets, but PC makers are claiming even longer battery life. Lenovo is claiming its new ThinkPad X1 Carbon will have 15 hours of battery, while the ThinkPad X1 Yoga 2-in-1 will offer 16 hours. Dell is claiming battery life up to 15 hours for its new XPS 13 2-in-1, and 10 hours when streaming Netflix video. Those numbers are based on MobileMark benchmarks, but battery life typically varies in real world usage. Windows devices are also getting smaller because of thinner borders around displays. The best example is the Dell XPS 13, which is a 13.3-inch laptop compressed in the frame of an 11.6-inch laptop. It has a borderless display, with the screen dominating the entire display panel. The trend is growing with the new PCs, with a notable example being the ThinkPad X1 Carbon, which is a 14-inch laptop in a 13.3-inch laptop frame. Graphics processors in Kaby Lake chips are capable of processing 4K video, so you will be able to watch movies on a laptop with a screen or external display at that resolution. Intel is also partnering with video streaming companies to push 4K movies to Kaby Lake PCs. 4K movies from Netflix are already available, and Intel said 4K movies from FandangoNow and Sony’s Ultra 4K movies will come later this year. Users will need a Microsoft Edge browser to view the 4K movies. You’ll be able to hook up VR headsets to view movies, play games and roam virtual worlds. Many headsets—which will need to be hooked up to Kaby Lake PCs—will come later this year from Dell, Acer, HP, Asus and Lenovo, with prices starting at US$299. 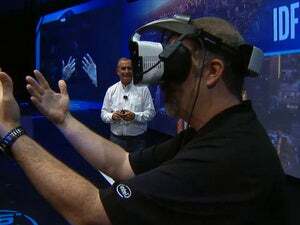 Kaby Lake is Intel’s entry into the emerging world of VR, which is providing a new way to interact with computers. The chip’s integrated GPU is able to handle basic VR, but won’t be enough for high-end headsets like Oculus Rift or HTC Vive, which need discrete GPUs from Nvidia or AMD. Microsoft wants to kill passwords with Windows Hello, which can log users into PCs via facial recognition, fingerprints or retina scans. Intel’s providing an alternative to Windows Hello called Authenticate, which requires multiple authentication techniques to log in to PCs. For example, users may be required to log in twice—once during the pre-boot sequence and then again in to Windows once the boot is complete. Authenticate is available only in business PCs with Kaby Lake vPro chips. Intel claims Authenticate is more secure than Windows Hello, as user data is secured and stored in a special CSME (converged security manageability engine) chip, which has its own operating system and firmware. Microsoft and Intel are co-developing a version of Authenticate and Windows Hello with multi-factor authentication to log into a PC and Windows. PC designs could change forever with the superfast Optane, a new class of storage and memory that could replace conventional SSDs and DRAM. Intel claims Optane-based SSDs are 10 times faster than today’s SSDs, and denser than DRAM. But here’s the bad news: the first Optane units will be lower-capacity caching storage, not full-fledged SSDs with large storage capacity. The initial Optane units will help load the OS, applications and games faster, and will work with only with Kaby Lake PCs. It could be ideal for gamers looking to buffer games, or those running engineering applications or creating virtual reality content. The new Kaby Lake chips have faster CPUs and GPUs so applications and graphics can run faster. PCs are also faster as Windows 10 has also been tweaked to work closely with the chip. PC makers are seeing CPU performance improvements between 5 and 15 percent with Kaby Lake chips compared to the predecessor Skylake chips. Modems have been in laptops for years more as an afterthought, but not anymore. Lenovo is offering modems as a standard feature in its ThinkPad X1 laptops and 2-in-1s so users can connect to cellular networks if Wi-Fi isn’t available. Like with smartphones, cellular modems will drive communications in laptops, especially with 4G network speeds going up and 5G networks around the corner. Gamers craving more performance will be able to overclock the Core i7-7820HK Kaby Lake chip, which has a base speed of 2.9GHz but can be cranked up to 4.4GHz. Look for the chip in Dell’s Alienware 15 and 17 laptops, which are being launched at CES. There’s a renewed effort to cut cables from PCs with wireless charging and data transfer technologies. Wireless charging laptops are being shown at CES, and Intel’s increasing its focus on bringing WiGig wireless technology to PCs. WiGig can wirelessly connect laptops to peripherals like storage devices and monitors, providing a way to get rid of connectors and display ports from PCs. The wireless technologies are still years away from widespread adoption, but gaining steam again after a few years of inactivity. Be it through pen, voice, touch or typing, PCs with Kaby Lake chips will provide a more natural way for users to interact with PCs. Intel and Microsoft are developing technology so users can shout out commands to the Cortana voice-activated assistant from longer distances. Additionally, Microsoft is making it easier to take notes on Windows PCs with styluses.